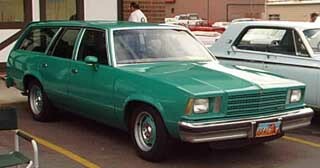 A skateboarding friend bought a 1978 Chevy Malibu station wagon, light blue, from his father for $50. It was a nice gesture from his Dad to get him some wheels because his old car broke down. He did what any respectful teenager would do and drove it. For one day. On the second day there was a gathering out back and he removed the entire top of the car with a Sawzall. Just cut it off. The windshield stayed, but the back part came off: roof, pillars, windows, everything. It started to resemble a very long, very low pickup truck, complete with the Brady Bunch type rear facing rumble seat. Nevermind that the edges where the top section was cut off were all gnarly and sharp, or that Chevrolet probably never planned for a roadster version, he thought it would be cool. So we all piled in it around dusk and went cruising. By "all", I mean there were three people across the front seat, four people crammed into the back seat (facing forward) and three more people and assorted skateboards and things stuffed in the rear facing back back seat. Summer evening, hot and humid but smelling sweet. We cruised. We cruised some more. We laughed. Other people saw us and their reactions ranged from turning away disgusted to laughing out loud when they saw it. We went through a drive thru to get food just to see what they would think. Then we quietly pulled to a stop, and a local cop pulled up beside us. A hush fell over the car because we knew our trip would be cut short. No one moved, we all tried to look casual: in a 78 Malibu station wagon with the top hacked off and stuffed with teenagers smoking cigarettes and blasting The Misfits. Someone finally turned down the radio. The cop took one look at us, shrugged and drove away. The crowd went WILD. We were stunned. We cruised. We got the idea we should jump the railroad tracks. We did. Then we jumped them again, and again, and faster and faster. Backwards and forwards and forwards and backwards. I can't remember if the car made "a noise" or if we finally tired of the tracks, but we set off for home. The car didn't go quite straight anymore. It's kinda hard to explain. The headlights were facing left, the tailights were facing right, and yet the car was going "straight" in the lane, kinda like a crab, sidling down the road making ominous clanking noises. It looked like we were about to make a left turn all the time. Even with our enthusiasm, we considered this a bad thing. The brakes didn't work so good, then less, then not much at all. We decided to park it. While many Malibu station wagons have plodded along throughout their life filled with blue collar workers, sticky children and groceries, this one went out with a BANG. He sold it to a local junkyard for scrap. Got $50 out of it. in a 78 Malibu station wagon with the top hacked off and stuffed with teenagers smoking cigarettes and blasting The Misfits. That's great Bob, I'd have loved to have seen that car trying to make it back home. mine was a 1983(4?) olds town and country. and we didn't cut the top off, but there was a set of rear seats. and i filled that fucker full of skins on our weekend trips to the 930. Not exactly a punk sort of thing, but one of my friends in college had a fraternity brother who bought an old black Caddy *hearse* complete with the little curtain. Pack a bunch of guys and a *keg* in back and it was a blast. The look inthe eyes of the late nite Taco Bell drive thru crew was priceless. As I recall the rear window was power, we left it and painted a hand with the middle finger rising proud. If someone got a little too close we just pressed the up button and they got the idea and backed off.